As cyclist, there are many things under our control when we ride. Unfortunately, the weather isn’t one of them. However, this didn’t stop Mark Kransz, sponsored rider for Hawk Racing, from having an exciting and successful weekend of racing, including two third place finishes. Ishpeming, a town in the Upper Peninsula of Michigan, didn’t exactly have the favorable eye of Mother Nature in the weeks leading up to the 2019 Polar Roll event. Two weeks ahead of the even, a heavy ice storm downed trees throughout the race courses and coated the significant amount of snow that had already fallen in the season with a hard crust. This would have created enough of a headache for any race organization team. However, Mother Nature had another curve-ball in store. In the week leading up to the event, a blizzard dropped forty inches of snow on Ishpeming and the surrounding areas. This left the trails buried and impassable. A call went out for volunteers to help get the trails back to race condition, and Mark answered that call. In the days leading up to the event, Mark spend long hours day and night on the back of his snowmobile clearing trees and shoveling trails. The trails were still soft come race day, which made riding impossible after twenty riders, but at least the trail was mostly cleared of hanging branches. The XC race ended with a 75% DNF. These conditions didn’t stop Mark, though. Determined to put in a strong performance for the weekend, Mark grabbed the wheels of the lead pack early, and stuck with it. A lead pack of three riders formed early on, and pulled away quickly. Mark hung with this pack early, before trail conditions broke it apart and spread the three riders out. The lead riders ended the race with significant gaps between themselves as well as the pack. A five minute gap separated each of the lead three riders, with a ten minute gap separating Mark from the main field behind him. Thus, the first podium finish of the weekend was under his belt. 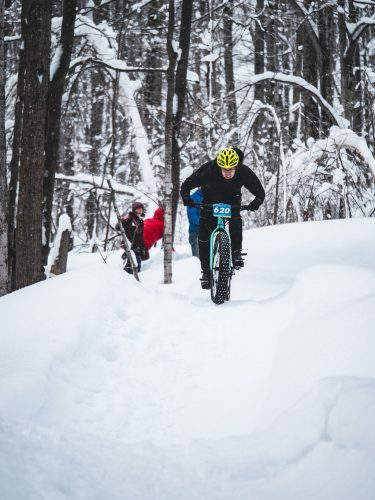 The follow day held the snow bike enduro race, which took place on trails that are technical under ideal conditions, let alone buried in snow and ridden on a fat bike. What transpired was a fast, technical enduro that pushed the riders to their limits. Riding a narrow trail through drifts nearly as high as the handlebars, Mark managed to pull off yet another third place finish to make his second podium of the weekend. Despite dealing with a winter that has dumped over two hundred inches of show on his area, Mark has been doing an amazing job with his training and racing. We look forward to seeing what this season has in store for him. His next race is in Texas, which should have significantly less snow. One of the things we love about our riders is their sense of humor and personality. So, below is a video Mark made about his experiences at the Polar Roll and in the week leading up to it. Enjoy his experiences in his own words. Rob is Vice President of Sales and Marketing for Hawk Racing. An avid road cyclist and mountain biker, he can often be found on the roads and trails around Fort Wayne.